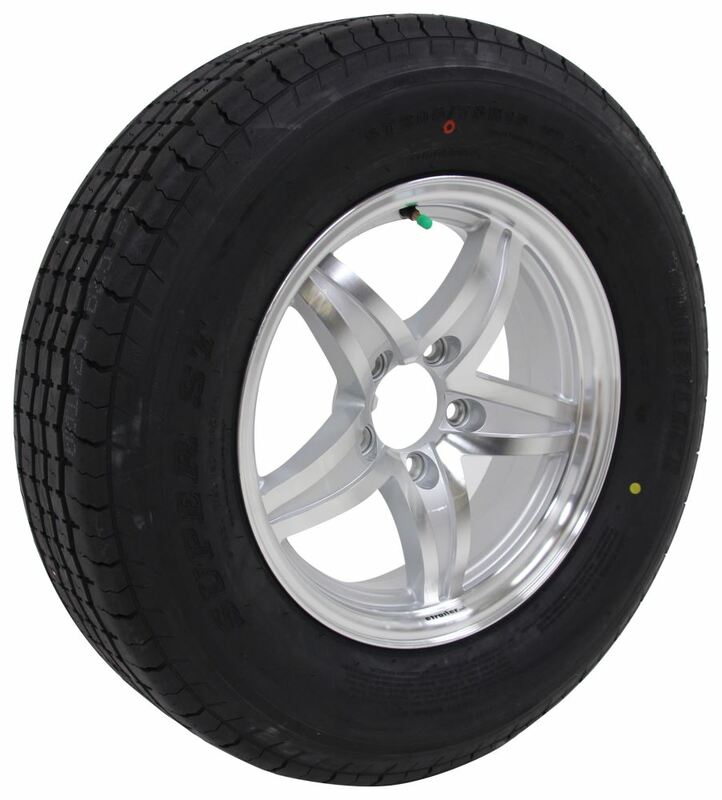 Radial tire has 8-ply rating and 2,150-lb max load at 65 psi. 15" x 5" Aluminum wheel has 5 on 4-1/2 bolt pattern. Nitrogen fill maintains tire pressure. 1-Year No Excuses Guarantee on tire. Complimentary roadside assistance included. Lowest Prices for the best tires and wheels from Westlake. 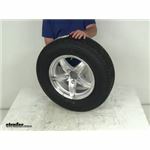 Westlake ST205/75R15 Radial Tire w 15" Lynx Aluminum Wheel - 5 on 4-1/2 - LR D - Silver part number LHAW320 can be ordered online at etrailer.com or call 800-298-8924 for expert service. Radial tire has a ply rating of 6 and a 1,820-lb maximum load at 50 psi. 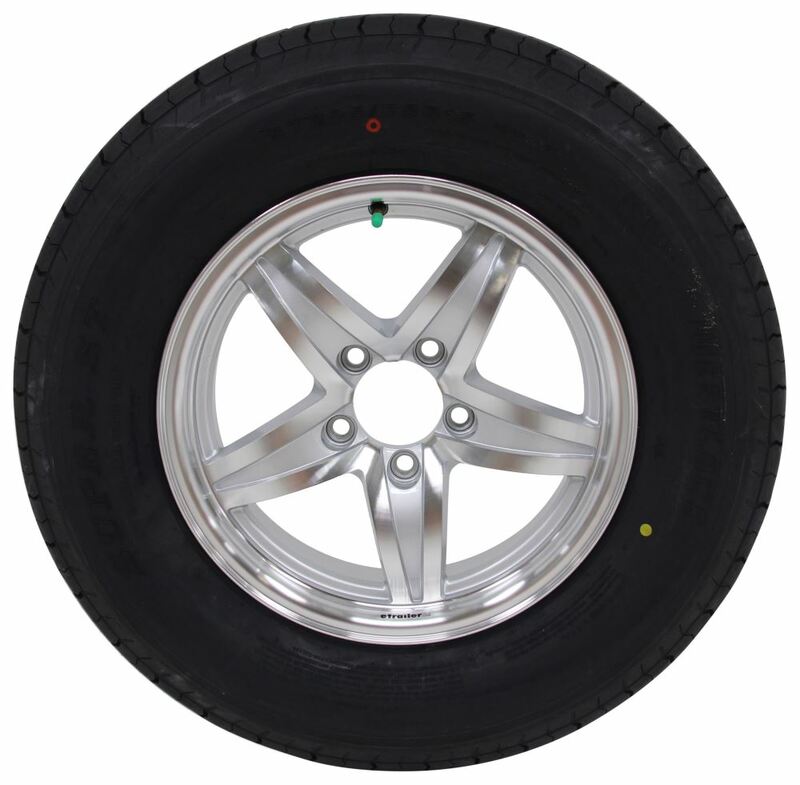 The 15" diameter x 6" wide aluminum trailer wheel features a 5 on 4-1/2 bolt pattern and is corrosion resistant. 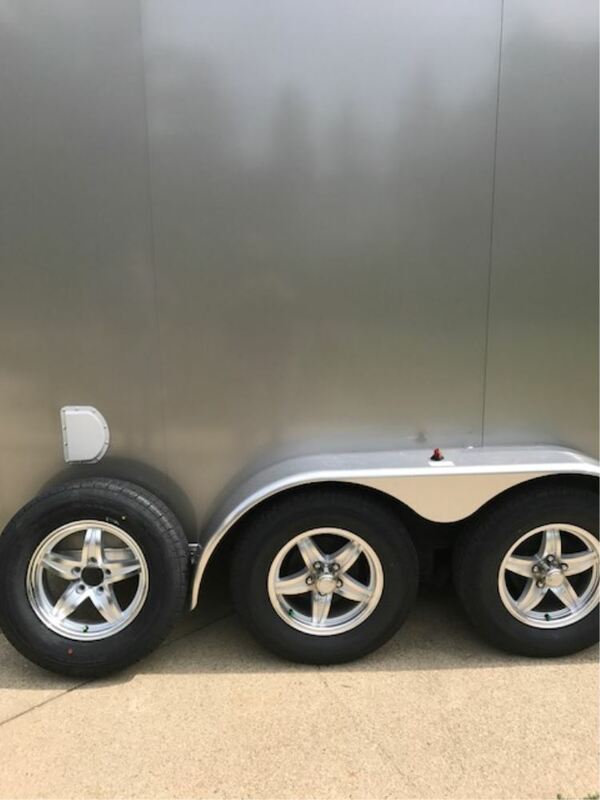 Today we're going to take a look at the West-lake ST20575R15 radial trailer tire in load range D on a 15 inch length silver aluminum trailer wheel with the 5 on 4 1/2 inch full pattern. This wheel is ideal for RV's, campers and trailers. 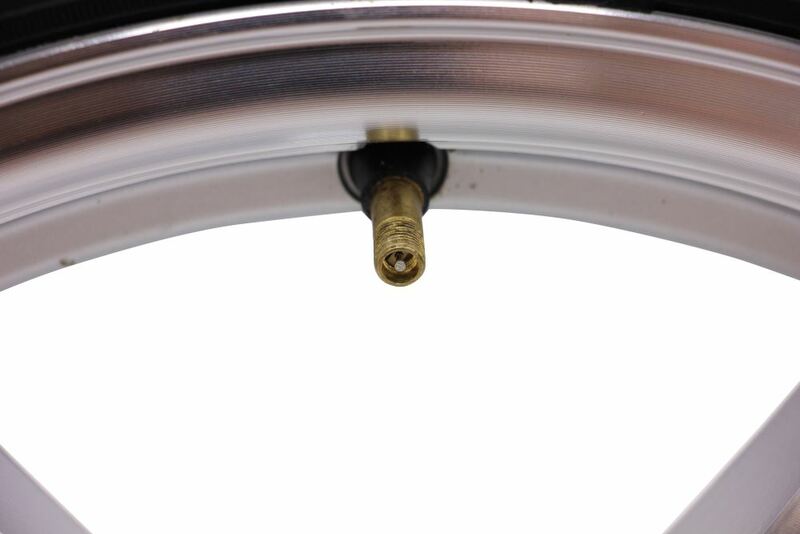 The aluminum wheel that it's on is very durable light weight and rust proof. 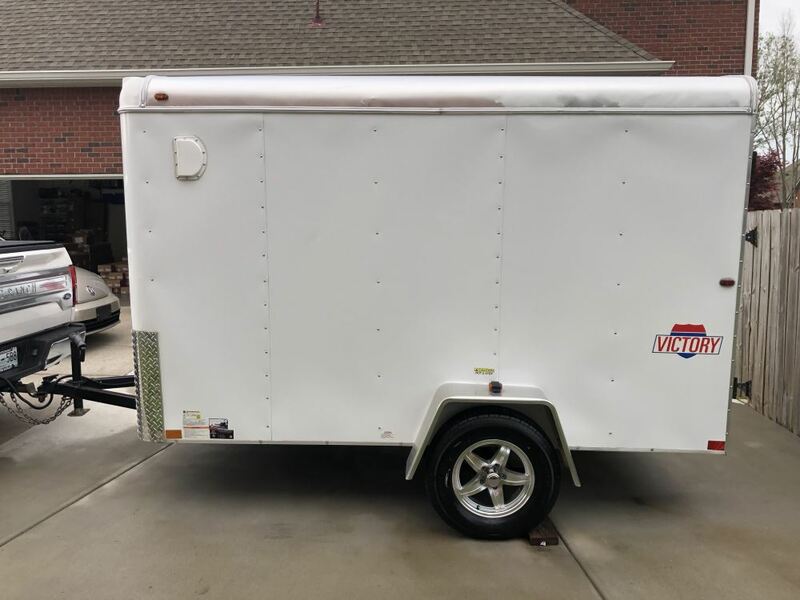 The style is a links 5 spoke design as you can see here this will upgrade the appearance of your trailer. If you notice they have a machine edge on the spokes here and then the silver accents is between the spokes. They do use an automotive grade clear coat finish on the front and even the back of the wheel just to protect the wheel from any scuffs and scratches. 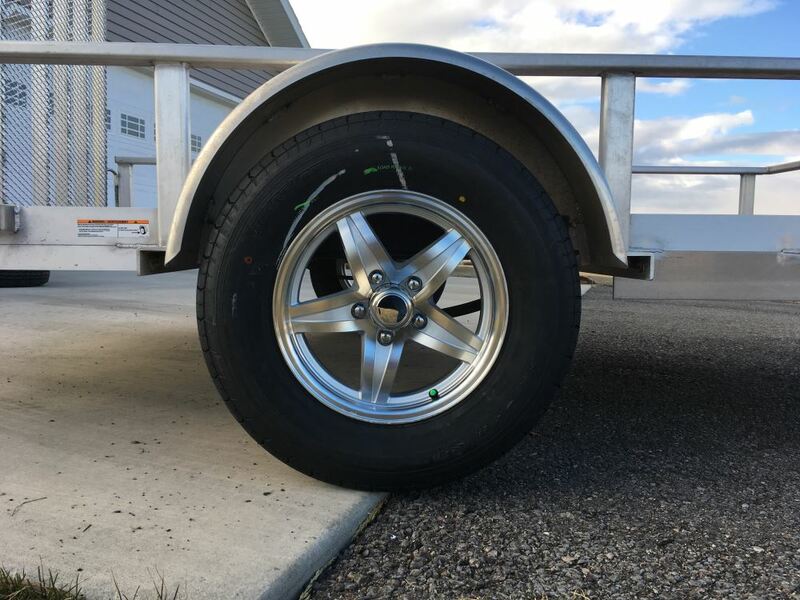 The other nice on this aluminum wheel is if you'll notice around the lug holes they do use the pressed in seal inserts around the lug holes and the reason they do that is to help prevent any damage to the lug holes or the aluminum wheel while installing your lug nuts. The tire mounted on this wheel is a West-lake radial tire, it is made of high quality of rubber, which is reinforced by layers of steel and polyester belts. This tire is great for highway use. It has a nice tread design gives you excellent traction, they do use a nylon overlay to help prevent tread separation and it also has tread-wear indicators that you'll see on your passenger car tires, what that is if you go around the should you'll see a TWI designation and it's every so often. Right where it says TWI if you go to the tread grooves and you'll notice a raised area, almost looks like a speed bump, that tread ware indicator is at 2-30 seconds tread depth. 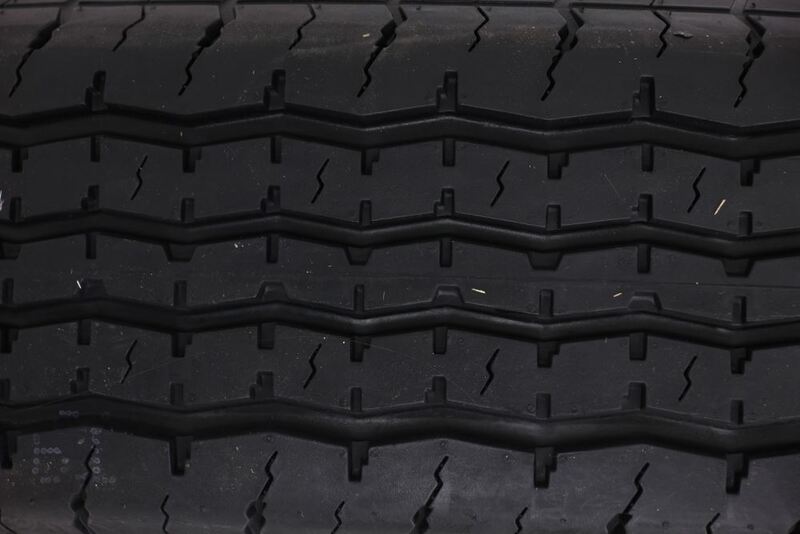 When this tire wears down the tread ware indicator if a straight line all the way across the tread, that means your tire is officially worn out. Just by looking at where the tread-wear indicators are as your tires wearing it gives you a good indication of how it's wearing. 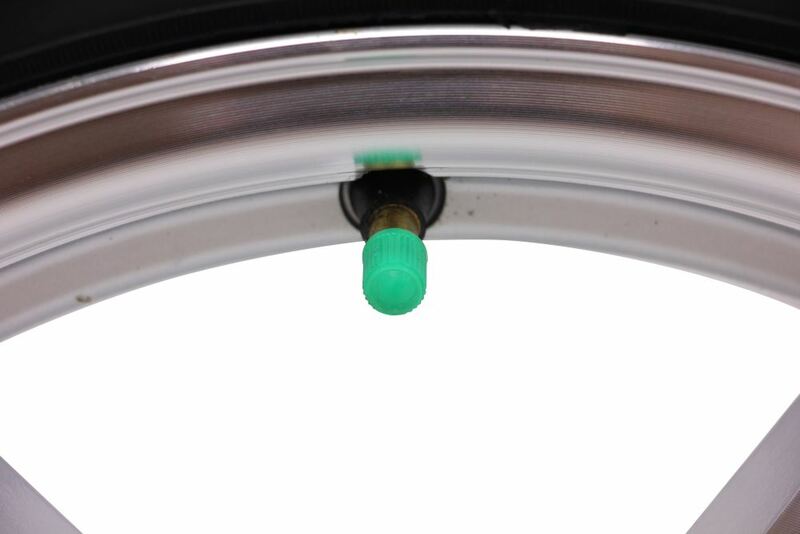 This time wheel assembly is inflated with nitrogen, that's why we put the green valve cap on the stem to let you know that it is nitrogen. Nitrogen will maintain the tire pressure for longer periods than standard air. It will help prolong the life of the tire and even the wheel. This tire is a special trailer tire design, it will couple the strength of a bias tire with the durability and stability of a radial tire. 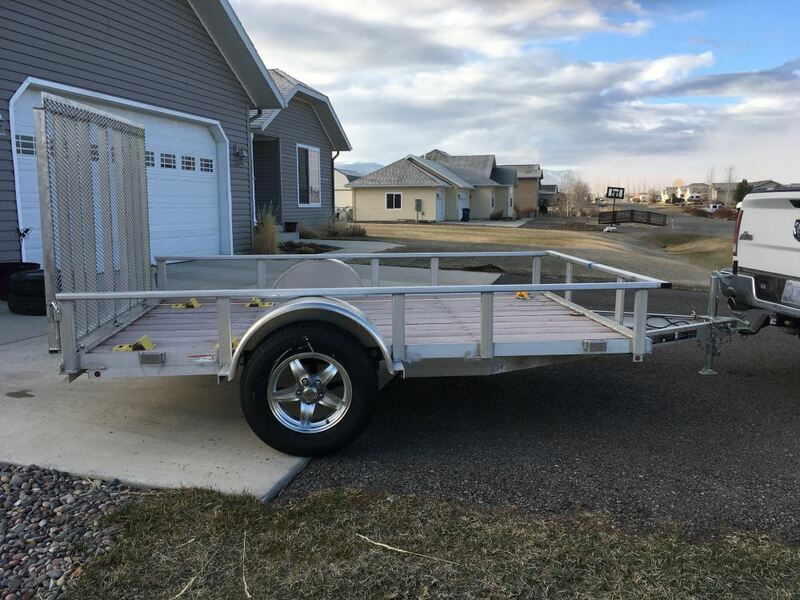 It is created specifically for trailers not intended for use on any other vehicles. Also, what comes with this is a complimentary 24 hour road side assistance program for one year from the manufacture. This whole assembly does meet the DOT or the Department of Transportation specifications. A few specs on this starting with the wheel. The diameter, which is inside to inside, is 15 inches. The width on just the wheel is 5 inches wide. The bolt pattern on this wheel is 5 on 4 1/2 inches. If you ever wanted to measure that on a wheel like this that is an odd number of lugs, just pick one of the holes, like this one, and you'll measure across to either one of these. When you measure it's from the center of the starting hole to the furthest edge of whatever hole you go to. On this one if we put a ruler it's 4 1/2 inches, so it's 5 lug 4 1/2 inch bolt pattern. It has a wheel lug size of 1/2 inch by 20. Weight capacity on just the wheel by itself is 1820 pounds. The pilot hole diameter, the large hole in the center of the wheel goes over the hub on your trailer, 3.19 inches is the diameter. 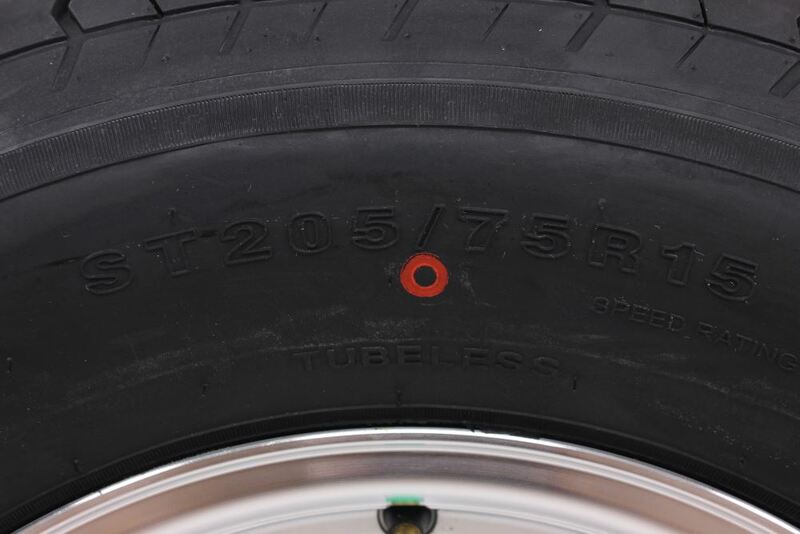 The tire size, which will be stamped on the sidewall, ST for special trailer 20575R15, the R stands for radial tire. Section width on this is 8 inches, overall diameter from the bottom to the top when it's inflated is 27.2. 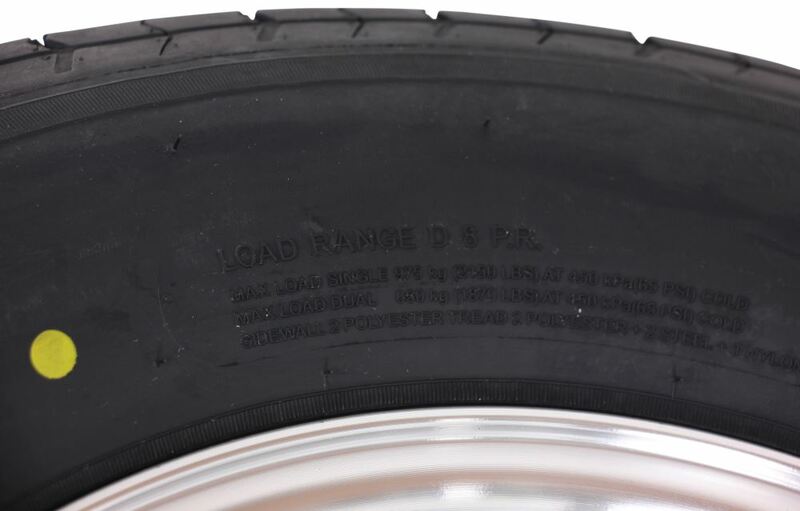 This tire is a load range D, which means it's an 8 ply rated tire has a maximum load capacity of 2150 pounds at 65 PSI. The last thing I want to mention is a lot of your new trailer tires are coming stamped with a speed rating on the tire now. The speed rating is always designated by a letter, on this one where you'll find it is right after the size you'll see two numbers for the load index and then right at the end the letter L. Speed rating L means 75mph. That should do it for the review on the Westlake ST-20575R15 in a load range D on a 15 inch silver aluminum trailer wheel with a 5 on 4 1/2 inch bolt pattern. Haven’t had to use it, since it’s a spare. Well after about 500 miles , as a friend was standing next to it when we paused for a break and the sidewall cord on tire blew out . This was on a att dual axle trailer, an Aluma Trailer with two quads and fuel . Not real happy. This was last year . I was happy to begin with , but not so much . I still have the tire as a reminder that it’s best to buy locally and from a good tire dealer . I’ll send it to you but l’m not Keen on wasting $$$ just to ship it back . I’m in the Landspeed community and I don’t need problems when going to race the vehicles I help pit for and on team I help sponsor. One team I’m on is the North American Eagle, when going to run the Eagle the tire blew and a lot of people there gave me a bad time for buying cheap tires . Only due to the fact that I have 2 axles under trailer 4 tires and I carry 2 spares , I didn’t change other tie of the 2 I purchased for you . I’ll wait till it blows , which I’m surprised it hasn’t happened yet . $115.99 would be the tire that you would need as replacements for these Westlake tires. 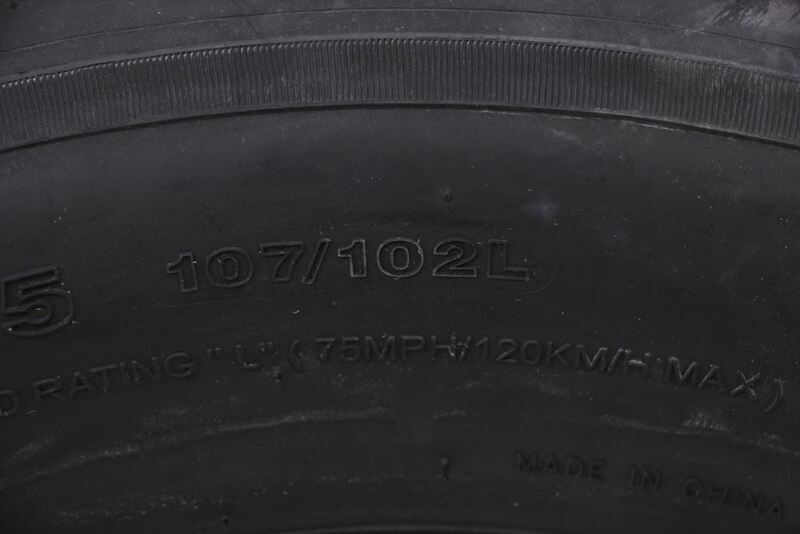 The Lionshead Tire and Wheel # LHAW320 has a speed rating of L for 75 mph. The rim is the same as # LHSL301. If you want a tire that has an M speed rating (81 mph) you can use the Taskmaster # TR20515D. However, they would not come mounted. You are correct that you are limited by the lowest rated component, which in this case with part # LHAW320 is the wheel at 1,820 pounds. For a rim with a higher capacity you can piece together your own assembly using the same tire, part # LHWL300, with a different wheel. We have the Lionshead Bobcat that has a similar look only in black, part # LHSO320B. It's a 15 by 6 inch rim which still fits the 205/75-15 tire and its capacity is 2,150 pounds like the tire. Yes, we have tire and wheel combo # LHAW320 or for a wheel only there are several options including # LHSO320B which has black trim and a similar design though not exactly the same.